TALLAHASSEE — Property owners would be the big winners in a tax-relief package released Friday by Gov. 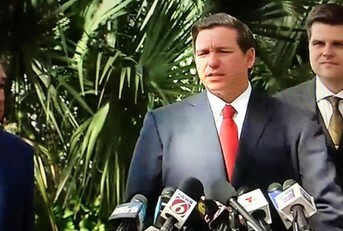 Ron DeSantis as he proposed a record $91.3 billion budget for next fiscal year. Unlike the broad, business-friendly tax packages that have rolled out of the Legislature the past few years with former Gov. Rick Scott’s support, DeSantis offered a lean wish list for lawmakers to consider when the 60-day legislators session begins March 5. Meanwhile, DeSantis also is asking lawmakers to keep alive an $85 million-a-year economic-development fund that was created as a compromise after a battle between Scott and House leaders over the future of the state’s tourism and business-recruitment agencies. “We want people who are working hard here to be able to live without being taxed excessively,” DeSantis told reporters in the Capitol on Friday. The $335 million tax package features three items: a back-to-school tax “holiday” that would allow shoppers to avoid paying sales taxes for three days on clothing, school supplies and personal computers; a one-week tax holiday that would allow people to avoid paying sales taxes on hurricane-preparation items, including generators; and a reduction in school property-tax rates. Spread across the state, the reduction proposed by DeSantis to the “required local effort” in the Florida Education Finance Program, which is the state’s main school-funding formula, accounts for a projected $289.7 million of the estimated savings in the overall tax plan. Despite DeSantis’ approach, expect lawmakers to again consider a broad menu of tax cuts before a final package is put together. Last year, a $171 million package offered a three-day back-to-school tax holiday on clothes and school supplies; a seven-day disaster-preparation tax holiday; and property-tax breaks due to such things as damage from hurricanes and tropical storms. Also in the package was a 9 percent reduction in traffic fines for motorists who attend driver-improvement courses; a reduction in a business-rent tax; and sales tax exemptions on generators for nursing homes and assisted living facilities, agriculture-related fencing materials after damage in Hurricane Irma and equipment used in the production of aquaculture products. In 2017, a $134.7 million package expanded tax relief for certain affordable housing, increased tax credits for voluntary brownfield clean-up and featured tax exemptions on feminine hygiene products, animal health products, operations of municipal golf courses and construction materials, in addition to offering back-to-school and disaster-preparation tax holidays. For the 2019 session, Sen. Keith Perry, R-Gainesville, has already proposed a 10-day sales tax holiday for back-to-school shoppers, who would be able to avoid paying sales taxes on clothes costing $100 or less, school supplies costing $15 or less and personal computers and accessories costing $1,000 or less. Meanwhile, DeSantis is keeping alive efforts to maintain the Job Growth Grant Fund, at least for this year. Lawmakers approved the fund in 2017 after a battle between Scott and House leaders about economic-development spending. Senate Appropriations Chairman Rob Bradley, R-Fleming Island, said last week that a close look is warranted at the fund. Bradley said his primary concern is that the “legislators are appropriators, not the executive.” Under the program, the governor is given wide discretion in how to use the money for regional projects. Before leaving office last month, Scott spent all of the funding for the current fiscal year, which ends June 30. DeSantis’ budget proposal maintains current funding levels for the public-private agencies Enterprise Florida and Visit Florida. Visit Florida got $76 million this year to market the state. 5 Responses to "DeSantis Backs Property Tax Relief, Job Growth Fund"
And raise your hand if, like The Maven, you pay more Leon County property taxes than you do federal taxes. I pay way more in federal taxes than property taxes so I’m not going to raise my hand. Property taxes should be decreased and not by just a few bucks. No one should ever be put in a position of losing their home if they cannot afford to pay a property tax. It’s an illusion that we own our homes. If we don’t pay the government for them every year, they will take our homes from us. Libs love property taxes because they are progressive. Sales Tax is considered regressive. Come to think of it, property taxes are the very definition of progressive. Just go ahead and kill all school funding, children are great at factory work and don’t need as many breaks as older workers.